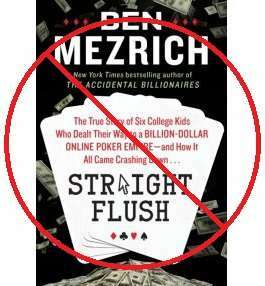 If you haven’t checked in on the story of the massive literary fraud perpetrated upon the reading public by Ben Mezrich in Straight Flush, then there’s no time like the present. Mezrich’s printed lies about the Absolute Poker scandal story run the entire gamut of writerly misdeeds, from falsification of his story’s timeline to the disregarding of visual factual evidence that proves the guilt of his book’s primary protagonists. A “true story,” Straight Flush isn’t. The most shameful part of it all seems to be the unrelenting publicity war being undertaken by Mezrich and his publisher, William Morrow Books (a division of Harper-Collins), in pumping Mezrich into high-profile mainstream appearances over the last two weeks. Disgusting, with not a single mainstream outlet to date bothering to investigate Mezrich’s misdeeds. When Mezrich Twitter-blocks the likes of the mild-mannered Melissa Hayden (along with many other prominent poker people), one has to know that something is really, really wrong. • Somehow managing to merge two separate federal investigations into Absolute Poker’s payment-processing activities into one. Straight Flush begins with a first-person account of Brent Beckley, one of the six SAE frat brothers the book, nobly surrendering himself to US authorities in the wake of his “Black Friday” criminal indictment on multiple felony counts. The Linwood Payment Solutions cash seizures had nothing to do with the Black Friday indictments for which Beckley was indicted. They were separate cases. • Beckley claiming that he quickly saved Absolute Poker millions by getting the processing rate lowered from 8% to 4% at one of the major processors handling the site’s transactions. Huge lie. The market rate was indeed 4%, but Beckley actually had the rate at a key processor lowered to 6%. It was important, however, to state the 4%, because industry insiders would recognize that. Per an inside source, who was privy to the business details and has provided alternate information to this writer, the other 2% went right into the pockets of Tom, Tatum, Beckley and the others via a kickback from the processor involved. • Beckley claiming that the US government ignored his plans to reimburse players via an AP plan that would have refunded as much as 75 cents on the dollar. This is pure fantasy. First, Beckley himself acknowledges that the company had no more than $15 million in liquid assets at the time of the “Black Friday” takedown of the site, despite assurances to its regulators that player funds were segregated. Absolute Poker owes players — mostly in the United States — more than $55 million to this day. That’s a two-layered lie right there. First, the processors (shady or not) are the legal agents of Absolute Poker. Those processors didn’t owe the players, Absolute Poker did, despite Mezrich’s deplorable twisting of language. Second, all the money seized from various Absolute Poker payment-processing accounts in connection with the Black Friday charges amounted to between $5 and $7 million. An additional $4 million or so went to satisfy the unemployment claims of the 400 workers laid off from Scott Tom’s Costa Rica customer service firm, IDS, and that money had to be paid before any player claims could even be considered. That left less than $5 million in available liquid assets. The only partial truth to any of this, as it’s mis-recalled on p. 282, is that the lawyers got a little bit of whatever was left. It’s all garbage, all of it. Absolute Poker’s core execs had already looted the company, and there weren’t any segregated funds anywhere to satisfy player claims. And Mezrich himself tries to bury the proof. See, that Linwood Processing case, mentioned above? It’s part of the same farcical absolution of responsibility spun first by Brent Beckley, and then by Mezrich. Linwood Processing was a sting operation set up by Maryland-based ICE (part of Homeland Security) agents, and yes, Absolute Poker did lose some funds there, but only a fraction of what was seized of the $50 million later Beckley claimed to be processed through the site over two years on behalf of AP. Money flows through these sites; it doesn’t stay in them. Meanwhile, Beckley allows that his name was all over the Linwood processing, but fails to mention that his name was all over all of the illicit processing on behalf of Absolute Poker, no matter what processor or banking channel was involved, but mentioning all those other shady arrangements might lose the expected punch from telling about the one time Beckley stuck his neck into the noose of a giant ICE sting operation. Mezrich muddles ICE/Homeland Security with FBI, but as a prominent attorney verified to me shortly after I published this post, these were indeed two separate investigations, by different agencies. To the contrary, Linwood was just a tiny piece of the AP operation. This stuff was the guy’s job, after all. No indictments were handed down from the Linwood seizures; the charges against Beckley emanated from separate processing agreements on behalf of Absolute Poker, involving some of the other third-party processors also listed in the Black Friday indictment.